The Conditions for Arc Warden/Phoenix and Winter Wyvern to cast spell become strict a bit more. For the Official map, i think PBMN still busy. Here are the reason why Official Map is a bite late. So, just try this un-official map first :D. Now PBMN is back to works again. 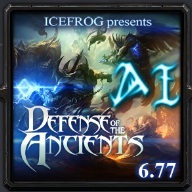 Just wait and see the official DotA 6.77 AI map will be released soon. I'm sorry but, when I try a link above.. it doesn't work properly.... :(. http://www.mediafire.com/?i6nzuc47u8drqqr - Invalid or Deleted File. Something wrong with the link?? ?